JERSEY CITY – March 21, 2019 – Francine Lane, TrialScope Vice President of Global Transparency, has received a 2019 Global Inspire Award from the Drug Information Association (DIA). Lane, chair of the DIA’s Clinical Trial Disclosure Community, and Robert Paarlberg, past chair, are co-recipients of the Community Engagement Award. The award recognizes DIA community chairs for consistently driving engagement while advancing knowledge and thought leadership within their membership communities. “Your extensive leadership as volunteers for DIA has been instrumental in furthering DIA’s mission, and we are thrilled to have the opportunity to inspire our members and Global Annual Meeting participants by bestowing this honor and highlighting your contributions,” reads the congratulatory letter from Joseph Scheeren, chair of the DIA board of directors, and Barbara Lopez Kunz, DIA global chief executive. Presentation of the awards will take place at the DIA 2019 Global Annual Meeting June 23-27 in San Diego. A video highlighting Lane’s and Paarlberg’s contributions of Lane will be shown at the event. TrialScope is the global leader in clinical trial disclosure and transparency management technology, supporting 13 of the top 15 industry clinical trial sponsors worldwide. TrialScope provides proven solutions that optimize the efficiency of disclosure activities, maximize trial data transparency, and foster more informed, engaged patients through open research sharing. 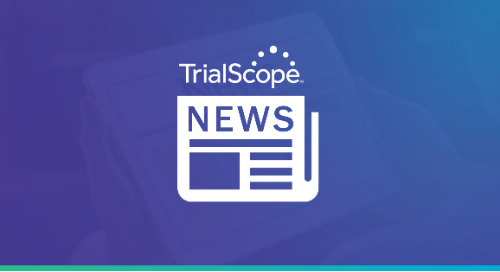 To learn more about TrialScope, visit TrialScope.com. DIA (founded as the Drug Information Association) is a global association that mobilizes life science professionals from across all areas of expertise to engage with patients, peers and thought leaders in a neutral environment on the issues of today and the possibilities for tomorrow. As a member-driven, volunteer organization, professionals from 80 countries have affected healthcare outcomes, by engaging with DIA through its network, educational offerings and professional development opportunities.